Low Carb Diet News - Tag Archive for "Addiction"
Paul van der Velpen, head of Amsterdam’s health service, said that sugar is ‘the most dangerous drug of our time’. The health chief – from a city that has a famously liberal attitude to cannabis – added that sugar is a drug like alcohol and tobacco and that its use should be discouraged. Writing on a public health website, he said that users should be made aware of the dangers. Mr Van der Velpen wrote that more and more people are becoming overweight and that this is increasing healthcare costs at a time when many governments are trying to save money. He added that obesity could be tackled by encouraging people to take more exercise, but that changing people’s diets would be more effective. He believes this is because sugar is addictive and is ‘as hard to give up as smoking’. As a result, he says sugar should be taxed in the same way alcohol and cigarettes are. He also suggests that the amount of sugar that can be added to processed food should be regulated. It would be interesting to know if this is particular to Clapton or something that shows up in others as well. between the ages of 18 and 35 in the hours after they consumed milkshake meals. 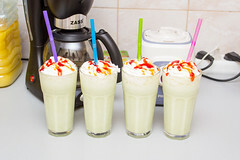 The milkshakes were identical in taste as well as calories, nutrients and carbohydrates, but one set of shakes was made with high-glycemic carbs, such as the kind found in white bread, white rice and processed sweets, that spike blood sugar more quickly. The other set contained low-glycemic carbs such as those found in whole wheat bread and brown rice that cause a more gradual rise in blood sugar. Lead study author Dr. David Ludwig, director of the obesity research center at Boston Children’s Hospital, said the brain activity may suggest why some people get stuck in a cycle of reaching for — and overeating — sugary, starchy foods. “Beyond reward and craving, this part of the brain is also linked to substance abuse and dependence, which raises the question as to whether certain foods might be addictive,” Ludwig said in a statement. Eating too many high-glycemic foods isn’t good for anyone, but the bigger picture of whether a person can become addicted to food — or to specific type of food like high-glycemic carbs — is more complicated, said Dr. Lisa Young, RD, PhD, adjunct professor of nutrition at New York University.